4 years after I thought I had beaten lyme disease I got knocked out by an overwhelming fatigue. It was March 2013. It was like falling into a coma but being fully conscious. The slightest endeavor was an enormous effort. I had to cancel all my obligations and responsibilities: I told people for whom I was cooking organic paleo meals that I wasn’t able to do that anymore. I had to stop taking care of people’s gardens. All I was able to do is lie on the couch. I had turned into a living zombie: breathing and alive, yet dead. Going to get groceries or going to get water from the water store just 3 min away cost me a whole day or two of mental preparations. I had to summon all my willpower to do basic things like cooking or taking a shower. I didn’t know what was going on, but I assumed the most probable cause was a lyme relapse. So I started doing what I believed had beaten lyme once before: ozone treatments. First I took out what I thought was the biggest hammer in my O3 arsenal: ozone IVs. Unexpectedly, I barely reacted to them. They neither made me feel better nor worse or just very slightly so. The ozone wisdom dictates that if I indeed had some form of infection (doesn’t matter whether bacterial or viral) I should have either felt a strong improvement after the ozone treatment or a worsening in which case it would have been die-off. But I didn’t. Doing ozone did not trigger the same response in me as it did years ago before i shot my first video “Ozone knocks out lyme in under 1 year”. I also did not experience the same symptoms I had experienced around 4 years prior when I was convinced I had lyme disease: I didn’t have any of the former neurological symptoms like depersonalization or derealization, and no brain fog, or only minimal. It felt differently. It was just a crushing, overwhelming, monstrous fatigue. And difficulty concentrating. Keeping my focus while reading was extremely challenging for me. I spent watching stupid romantic comedies, reading celebrity news and watching brain numbing TV shows – after 10 years of near complete TV abstinence. Now it was seemingly all my mind was able to deal with. I started looking for answers to what was happening to me. – that sounded like a typical day for me. And whoever wrote this didn’t even know me! Yet was able to accurately describe how my day looked like. How was that possible? Clearly, I was onto something here. As a possible cause for adrenal fatigue some websites cited lyme disease. There it was, the explanation for what I was going through: this time around the lyme had for some reason taken up shop in my adrenals, creating a new set of symptoms requiring a different approach. I figured I was doing the wrong type of ozone: I had to get to the lyme critters in my adrenals. Adrenals, I read, did not have blood vessels – was that the reason why the ozone IVs didn’t show any effect? I had to get to them circumventing the blood route: I started doing ozone saunas. The saunas were impacting me horrendously: in the beginning I could often not bear sitting in the heat for longer than 20 minutes: I felt a pain in my upper abdomen, nausea, eyes rolling back in my head, I was stomping with my feet, it was just excruciating. Pure torture. I was taking this as die-off and thought that I was on the right track: lyme critters were in my adrenals and I was killing them off with the ozone saunas. I also did vaginal, rectal and ear insufflations and found myself again spending around 2-3 hours per day just ozonating my body. After 6 months of doing this EVERY DAY, I did feel an improvement in the fatigue but not to the degree I thought I should have felt if my problem was a bacterial infection. The ozone didn’t seem to have the same effect as 4 years ago. Something didn’t add up. And I still was not fit to go back to work. I had had amalgam fillings for probably more than 20 years and I had been fully vaccinated as a kid, like most people. I had the fillings removed in February 2011 but had never done any type of mercury chelation program. Was that what was going on? An issue I had grossly ignored which was now demanding my attention? In June 2013 I decided to do a hair test. My mercury levels on the test were as good as non-existent. So I thought “Phew! I’m clear! I don’t have mercury poisoning.” I guess it was true after all that ozone chelates mercury, how else could I have stayed free of that metal after having had amalgam fillings for 20 years? But what DID I have? 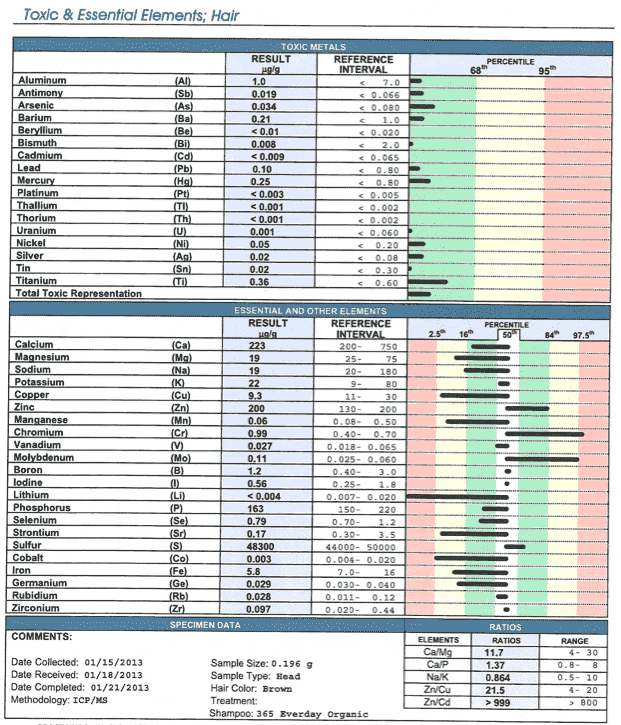 What was strange about the test was that all my essential minerals like magnesium, calcium, zinc, potassium, manganese, molybdenum etc. were very low or extremely low with some random spikes here and there. At that point I thought I had been on the best nutrition on the planet: 3 years of paleo diet followed by 1 year of ketogenic diet. Shouldn’t that have guaranteed an optimal supplementation with all the minerals and vitamins my body needed? The hair test seemed to paint a different picture. But I ignored it, not being able to make sense of it at that time. And the daily ozone saunas. By that time it was September 2013. Accidentally, I came across a unique approach to interpret hair test results (something a friend had pointed out to me months prior but which I had stupidly ignored, dear Mr. Bond) developed by Andrew Cutler a PhD chemist who recovered from mercury poisoning using an approach he himself developed, and later wrote books about it. Andrew Cutler was saying that one can be extremely mercury toxic even if the mercury levels themselves on the test are very low. The way to understand whether one is indeed mercury toxic or not is NOT by primarily looking at the mercury levels, but by looking at the essential minerals: mercury is the only known element which will cause a general blockage of mineral absorption, resulting in what Cutler calls: “deranged mineral transport”. After reading this I took another look at my hair test, and sure enough, it fit the bill! All my essential minerals were low or critically low as if there was something wrong with my body’s ability to absorb them. According to Andrew Cutler only mercury could do such a thing. Could it be that I was not only NOT free of mercury but on the contrary, profoundly sick with it? I could not tell so with 100% certainty because my test was not quite the right type of test to be able to apply Andrew Cutler’s interpretation rules, so called “counting rules”. For that, one needs a DDI hair elements test which displays the test results in a specific fashion and also uses the right reference ranges. This is a ‘DDI Toxic & Essential Minerals Hair Test’; it meets the counting rules #1 and #3 as explained in Andrew Cutler’s “Hair Test Interpretation” book, which means it shows deranged mineral transport and hence with a very high probability mercury toxicity; in spite of the fact that the levels of mercury on the test are in the normal range. I realized though that my non-DDI hair test offered a big enough indication for mercury toxicity, big enough for me to pursue further investigations: to try a few rounds of chelation and see how I would react to it. If I was indeed poisoned, I should react to the program. If I was not mercury poisoned, there should be no reaction. Luckily, all my amalgams had been already removed which is a prerequisite to be able to start chelation safely. Andrew Cutler Chelation – The Answer to My Problems? On September 19th, 2013 I started my first round of the Andrew Cutler chelation with 20mg of ALA taken every 3 hours, day and night for 72 hours. The immediate reaction was a sore throat, feeling like I was coming down with the flu, and increased fatigue. All those symptoms abated or went away completely after the 72 hours. I took this as a reaction to the ALA and as an indication that I was indeed mercury toxic. So I decided to continue. All those things have improved to a great degree, and are constantly getting better, but are not gone yet completely. I intend to continue the chelation until I’m completely cleared of all the symptoms or until I don’t feel any reaction to the chelators anymore. How long is it gonna take? I have no clue. How ever long it’s gonna take to become fully human again, as in: non-zombie like. Have I Ever Had Lyme Disease? I think so. But I’m not 100% sure, since I’ve never taken a blood test. Given that most of the tests are supposedly notoriously unreliable I never saw a point in spending money on something of so little diagnostic value. I’ve been diagnosed mostly clinically by my doctor who treated me for joint pain in my knees. – I received the lyme vaccine ca. 10 years ago. The vaccine has been since taken off the market because of several class action lawsuits by people who had fallen sick after receiving it. Was it because the vaccine contained live bacteria which gave people the very disease it was supposed to protect them from? I guess we will never know for sure, but many people, including me, experienced symptoms after the vaccine which were associated with lyme disease. – My first ozonated saline IV had triggered a dramatic reaction: my body had seemingly turned into glass, rigid, painful, ice cold and I was sweating at the same time. Half an hour later I had nearly passed out on the subway. Subsequent ozone applications rendered similar reactions but to a much smaller degree. Until this day, I have no other explanation for it other than ozone killing off pathogens. So, yes I tend to think that I indeed did have lyme disease. But to what degree – it’s really difficult to say. I think that the joint pain, feelings of having a veil between myself and reality (derealization or depersonalization) might have been part of lyme; or maybe it was candida. Which symptoms does the diet control which I have been following with just minor changes for close to 5 years? Is it possible that many of the neurological symptoms were induced by a reaction to gluten and excessive sugar consumption and not lyme? I don’t have enough information to be able to completely dismiss it nor to completely believe it. I also tend to ascribe episodes of air hunger or the sensation of not being able to breath to lyme disease or some other infection, since breathing vaporized diluted hydrogen peroxide (1% to 3%) completely reversed it. But would I have still become sick with lyme if I had never had mercury amalgam fillings put in my mouth? Is it possible that the mercury had impaired my immune system to the point that it could not handle whatever other pathogens there were? Possible. But then: if my latest episode of fatigue was not due to lyme but mercury, how do I explain my painful reaction to the ozone saunas? For one, sweat clears mercury out of the body, so it’s possible that that’s what created the bad reaction. Another possibility: ozone, heat and sweating will increase the metabolism which again will take the body faster into ketosis, which in turn can make candida go systemic creating pretty uncomfortable symptoms, congruent with what I have experienced during the sauna sessions. What Symptoms Did Mercury Cause? Depending on what new information one comes across and what new experiences one has, it can shape one’s understanding of the past. We tend to get attached to various ideas about our health issues. Especially, if we have invested time, energy, and money in certain doctors or therapies. As I have found out the hard way, this is an excellent way to sabotage one’s health recovery and stall progress. The best way is to keep an open mind, not to assume anything, but to just test theories. Andrew Cutler is of the opinion that the majority of lyme disease cases really are misdiagnosed mercury toxicity. In light of my latest health journey, I tend to agree with him. Over the past 5 years I came in contact with many people who think they have lyme disease or have been diagnosed with lyme disease. The overwhelming majority of them have a history of amalgam fillings or vaccinations or show mercury to be present on various tests. That’s why I think it makes sense that before one decides to undergo expensive treatments in faraway countries on different continents, or to spend thousands of dollars going to see various health “gurus” or doctors and to undergo extensive long term therapies, to first rule out one of the most toxic substances in the world for one’s health problems, which criminally enough is still regularly used in medicine: mercury. Often enough all that is needed is to do a hair elements test which one can obtain here or here for as little as $85. Together with Andrew Cutler’s counting rules explained in his book “Hair Test Interpretations”, your health history, and your symptoms you’ll be able to find out with a high probability whether it’s mercury that is making you sick, and not lyme. You can also join the Andy Cutler Chelation Think Tank on Facebook or the Yahoo groups Autism Mercury, Frequent Dose Chelation or Adult Metal Chelation to meet knowledgeable people who can properly interpret your hair test according to the Cutler counting rules. Typing “andrewhallcutler” “ALA” “flouride” in the onibasu.com search bar, checking the first three yahoo groups in the middle section and clicking Search! will render posts by Andrew Cutler which contain the words “ALA” and “flouride”. I also highly recommend the study of the following website: http://www.livingnetwork.co.za/chelationnetwork/chelation-the-andy-cutler-protocol/ which has all the information necessary to start chelating safely. If you have questions about ozone or want to share your experience, feel free to join the Facebook group “Ozone to Health”. All of the material on this site is intended as educational information only in regards to alternative healthcare options that are available to the healthcare consumer. The advice on this site are intended solely for informational and educational purposes and are not intended to replace your doctor. The FDA has stated that only medications (drugs) can cure an illness or disease. Please consult a medical professional if you have questions about your health. Pola, Thank you for yet another excellent contribution. One thing, is it possible to increase the contrast of this page? I just completed 1 month of 1200 mg combined ALA and DMPS per day having only mild reactions even thought I am extremely high in Hg possibly I’ve completed 54 rounds of DMSA. Question is what is the purpose for me to take breaks? Does it chelate more Hg in the long run? Is it healthier, say, for remineralization? as to contrast: can you make the fonts bigger in your browser? would that help? tell me what browser you use, i can help you find out how to increase the fonts. as to what is the purpose of taking breaks: in general AC says that longer rounds are more desirable. they minimize the redistribution at the end of the rounds. so you can do that, if you’re feeling alright ON round. but: ALA makes the body hang on to copper more, which can be a problem in excessive amounts and during longer rounds. copper can create same problems like mercury if there is too much. breaks in between rounds prevent that or minimize it. as well as zinc and molybdenum supplementation. do i understand it correctly that you’ve recently picked up the AC chelation after a longer break? when you restarted the chelation: did you use freshly bought ALA and other chelators? or did you use old stock? they do have expiration dates. so i would make sure they are fresh. I have adrenal exhaustion and am currently working to support my adrenals before starting a heavy metal detox program. However, being adrenally exhausted and sleep challenged has put me off AC protocol for the past 7 years since researching his work…due to the frequent dosing. I know there are those who don’t feel this is necessary and those who follow AC religiously and almost cult like. I am wondering if you tried other HM detox programs that didn’t involved the frequent dosing ..i.e. getting up 1-2 x per night? also, how many days did you go in between rounds? thanks. hi cordelia, no i’ve never tried other heavy metal detox programs other than andy’s. i did do saunas for 12 months. apparently 30-60min of sweating can be equivalent of a round of chelation with DMSA or DMPS. if you have trouble waking up at night, you can look into DMPS – it can be taken every 8 hours, so no sleep disturbance. or do saunas. i usually do 3 days in between rounds. thank you. I think I”ll give AC a try and see how I go. 4 days on, 10 days off. I will look into DMPS as well for the nightime dose. ALA has a half life of 6 hrs yes? i’ll add that in in about 3 months. I have a sauna here I bought to detox the metals. good to know it’s like a round! when you do sauna, what binders do you take while doing it? I would have thought it’s good to do saunas when you are on a round of DMSA? did you take other binders too? GSH? during rounds or all the time? I’m sorting it all out now. thanks again. I also resonate a lot with your experience. I have dealt with fatigue all my life, but debiltating the past 5 years. it’s like being buried alive. i wouldn’t wish this torture on my worst enemies. I have recently started on bioidentical hormones of hydrocortisol, progesterone, estrogen, and testosterone so I can begin this HM detox. I will also take anti-microbials as the pathogens will be released with the metals…candida, epstein barr. I have also wondered, like you, whether it’s Lyme causing my problems…(my main issues stim from vaccines and fillings and antibiotics)….i think these pathogens are there b/c our immune systems are compromised due to metals and adrenal exhaustion. that is why I’m not targeting them anymore, but going after the root issues and hopefully they will resolve themselves. I also developed autistic symptoms as a child and still have them (sensory). i developed OCD and self-harming behaviors after vaccines and fillings as a child. in 96, 22 vax in one month in the Peace Corps tanked my already fragile health. i have recovered from that. in 98, I got my fillings removed (unproperly) and re-poisoned myself i”m realizing….a long road for so many of us. very important: ALA has a half life of 3 hours, not 6! it needs to be taken every 3 hours, it can be stretched out to 4 hours at night, but then go back to 3 hours during the day. it’s good to start with DMPS, yes. i don’t take any binders, except for the chelators. with GSH you need to be careful – according to AC it’s not a binder but can swish the mercury around more in your body making you sicker than before. althought that’s supposed to be more true for the IVs than the oral stuff. I definitely sleep much better on round – most of the rounds. Each round has been a little different. I’ve never had as bad insomnia as others. I dream more now though and in color. Before that I would dream less and mostly in black and white. I also seem to sleep deeper. If insomnia is one of your biggest concerns I suggest you start with DMPS post amalgam removal. One can take DMPS every 8 hours – so it doesn’t disrupt the sleep. Later on you can add ALA which requires 3 hour intervals (which can be stretched out to 4 hours during the night). Hi pola.try chlorine dioxide extensively for 4 months,plus,it will oxidize metals deep in the tissue. 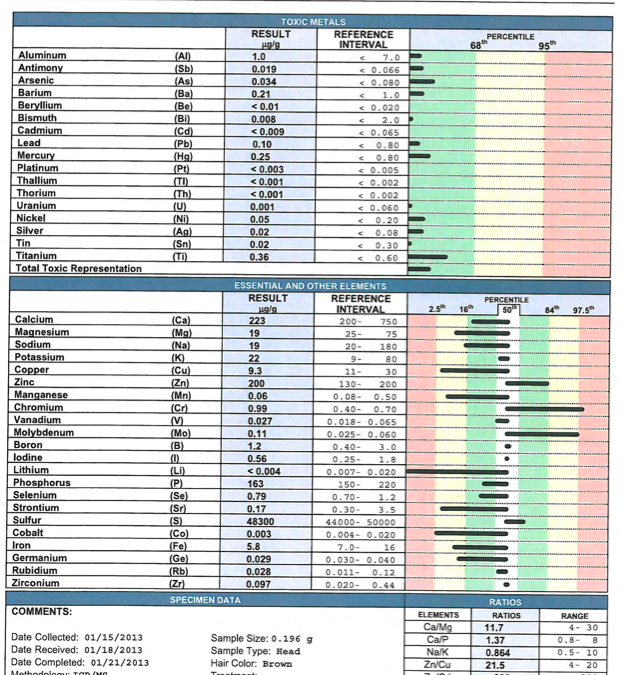 in light of this document https://www.tlch2o.com/courses/Chlorination404.pdf which cites among others anemia and damage to the nervous system in fetuses as possible side effects of chlorine dioxide, and given that ozone and h2o2 are both much stronger oxidizers as one can see here: http://www.lenntech.com/processes/disinfection/chemical/disinfectants-hydrogen-peroxide.htm without the negative side effects of CD, i really don’t see a reason to introduce that toxic chemical into my body. chlorine dioxide is an oxidizing agent – so one would expect it to improve some physical and neurological issues by adding more oxygen to the system or by killing off some pathogens. that might explain why autistic kids do better on it. i guess that might be the reason why also experienced neurological benefits from ozone. but neither CD nor ozone nor h2o2 nor any other oxidizing agent can remove metals from the body. if you understand how mercury, aresenic, lead are bound in the human system – by sulfhydryl groups, you understand that one needs a double bonded sulfur compound to unlock them from that bond. Is there a good resource to get DMSA, DMPS. I cant seem to find any companies tht sell low dose DMSA. Wow I have gone through so much of what you have. Do you take ala and dmsa together? Do you practise ozone and sauna while you chelate? If you do sauna what type as Cutler seems to advise against far infrared. Hi, yes, I take ALA and DMSA together most of the rounds. Sometimes I also take DMPS, but prefer DMSA just because it’s cheaper. I use a steam sauna and I use it with ozone, yes. But I do them very rarely now. Would like to do more often, though. Hi I am starting to get all my fillings and crowns out and I am removing a root canal that I think leaked into molar / root canal. I also have lymes! I believe it affected my eye an ear. When I walk I walk I feel like every 20 steps I feel like I am getting off an elevator? I hope after I get my mercury out and root canal and then takeDSMA protcol as long as necessary I can restore my body! Can this happen? if your symptoms are due to mercury, and you can’t exclude that they are, then yes proper chelation will very likely be helpful. DMSA is probably not gonna be enough though. At some point after the removal one has to add ALA. ALA is the only mercury chelator which can cross the blood brain barrier and chelate mercury out of organs. It’s also very important to take the chelators according to their half lives, as the Cutler protocol prescribes. So for ALA every 3 hours. For DMSA every 3 to 4 hours, unless one combines it with ALA, then one takes both every 3 hours. I had a hair test last August that came up with high Mercury level, accompanied by all the symptoms that other doctors could not diagnose. I just started to see a heavy metal and Lyme disease Doctor. I have to wait four weeks for test results. Meanwhile I am on meds and antibiotics . He suspects of Lyme as well. It is a couple of years since you wrote the article. Do you still think it is mercury poisoning that is your main problem? Are the improvements in your life more permanent since you have started the cutler protocol? And finally sorry if I missed it in the article but what is the main difference that one can tell if it is lyme or amalgam illness?? Or is it more the case that lyme is really amalgam illness. Btw I purchased a steam sauna and enjoying it. “Do you still think it is mercury poisoning that is your main problem?” – was, at this point mostly. I’ve successfully chelated over 172 rounds and 97% to 99% of symptoms are gone. So yes, I’m pretty sure it was mercury poisoning. “Are the improvements in your life more permanent since you have started the cutler protocol?” – yes. “And finally sorry if I missed it in the article but what is the main difference that one can tell if it is lyme or amalgam illness? ?” – the main way how to distinguish between Lyme and mercury poisoning is if you start doing the chelation protocol and you get a reaction. That’s how you know that you are mercury poisoned. If after months of several antibiotics you do not get any *lasting* improvement in your symptoms, it’s unlikely you had Lyme. “Btw I purchased a steam sauna and enjoying it.” – Great! you understand though that there is a right and a wrong way to take ALA? I am thanks Paola. I take ala every 3 hours during day and 3.5 hrs at night. Due to brain fog I forget a dose so need to stop the round – need to have an alarm going forward. If I take too high a dose of ala I end up being off my head. When you speak of doing saunas, do mean ozone saunas or another type? I’m going to get the EXT120 generator and was hoping you could recommend a less expensive ozone sauna that would work with this generator? Does ozone kill parasites via rectal insufflation? yes the saunas I talk about in this article were ozone saunas. Any sauna which will allow for your head to remain outside can be used with the EXT120 or any other ozone generator. On amazon you can get portable steam saunas for under $100: https://goo.gl/Vz9Gta which can be used as ozone saunas. I explain how this is done in this video: https://www.youtube.com/watch?v=9TcNhHvBXz8&t=1s . Copper toxicity and mercury toxicity can often display similar symptoms and one can make the other worse. I would look if you ever had an exposure to mercury sources like amalgams, vaccines, mom who had amalgams when she was pregnant with you, broken CFL light bulbs etc. Hey thanks for the details! Do you know if rectal insufflation kills parasites? I’ve never been tested but know I have them (like most people). What procedure (not pills or supplements) would you say helped you the most with OCD and insomnia? I do take some supplements based on my hair analysis. I’ve tried ALL sleeping supplements and they do not work. Although a 1,000+mg dose of magnesium will usually help me sleep for 2-3 hours max. The two tents you recommend are not made of PVC, can you recommend one that is made from PVC? “What procedure (not pills or supplements) would you say helped you the most with OCD and insomnia?” – With OCD: exposure therapy. It was a tool I was taught at a private clinic in Germany. The OCD was accompanied by profound social anxiety. During exposure therapy you learn how to expose yourself to your biggest fears, then how to maximize that fear internally, until it dissolves by itself. Insomnia – staying away from coffee, taking magnesium before bed, 500mg and the Andrew Cutler chelation. “The two tents you recommend are not made of PVC, can you recommend one that is made from PVC?” – the silver looking one is lined inside with a PVC coating. The blue one is vinyl cloth, which is PVC. PVC and vinyl are the same material, only a different form. They are both very ozone resistant. I have used both saunas extensively for ozone purposes and they work great! Did you keep your ala/dmsa dosages at night to 3 hours or did you stretch it out to 4? I keep it to 3 hours day and night. Hi. Thanks for the helpful article. I am just about to start AC chelation and have a portable sauna and ozone generator. My concern with using the sauna is that I will sweat out the mercury but it will then be released into my living space and I will end up reabsorbing it. What are your thoughts on this? what you sweat out, flows down your body and ends up in the towel or the bottom of the sauna. The mercury then gets trapped in whatever fabric you use to clean the sauna or your body. There is no real concern about it being released into your living space and being reabsorbed. Dont’ worry about it. Excellent website! I have been learning alot about home ozone treatment here, to which I am very new. I have been suffering from CFS, recently diagnosed as Lyme, for almost 2 decades now and find that, for me, mercury and metals definitely are part of the problem. What I also found interesting reading about is how EMF’s actually play a big role in both Lyme disease and metal poisening. Apparently, exposure to EMF’s keeps metals locked inside of cells and makes it very hard to eliminate them, while the same EMF’s turn Lyme viri into superbugs. Have you ever used EMF protection shields in combination with ozone treatment or metal chelation? I have tried AC chelation for about 1,5 year with very poor results. 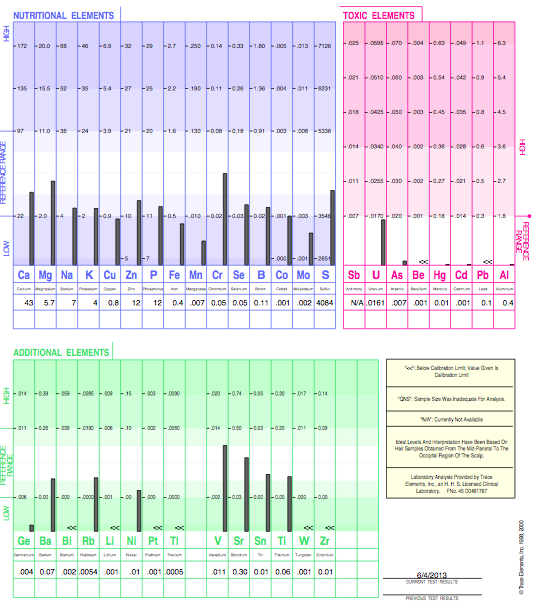 I actually had more improvement with a Nutritional Balancing program, but I am now looking into this ozone treatment and EMF protection, at least for my bedroom-area, to see if it can change or speed up healing. I do not appear to be sensitive to electromagnetism, so no I have not looked into that. Also, from what I understand, if it is not done correctly, a metal shield can actually increase the radiation. So, this appears to be a sensitive matter.